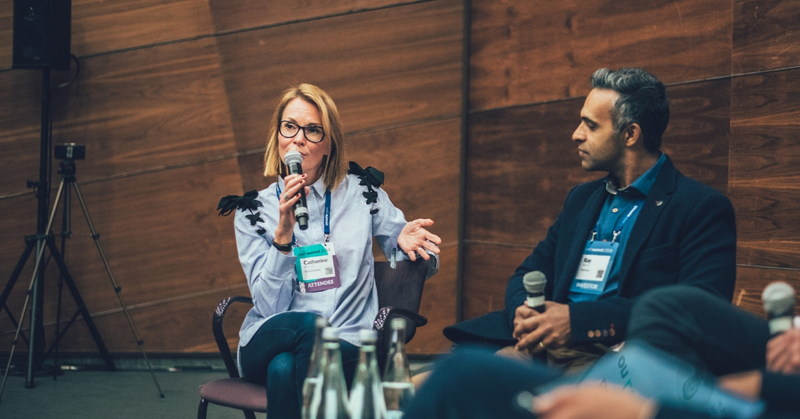 Catherine Bischoff (Chief Relationship Officer at Factory Berlin), Ray Newal (Managing Director, India at Techstars), and Barry O’Brien (Managing Director at Silicon Valley Bank) shared their stories on ups and downs of running and scaling startups. The discussion, filled with unique insights into local startup markets, was moderated by Wiktor Schmidt, Netguru’s CEO and co-founder. The diversity of our panel – our panellists came from US, Germany, India and Poland – was no accident. Originally, VC funds and media were heavily focused on recognizing great companies and founders and supporting them in Silicon Valley to build Valley-style businesses. But it’s no longer a Silicon Valley elite club. Great people and great challenges exist everywhere. And great companies can be built anywhere in the world. 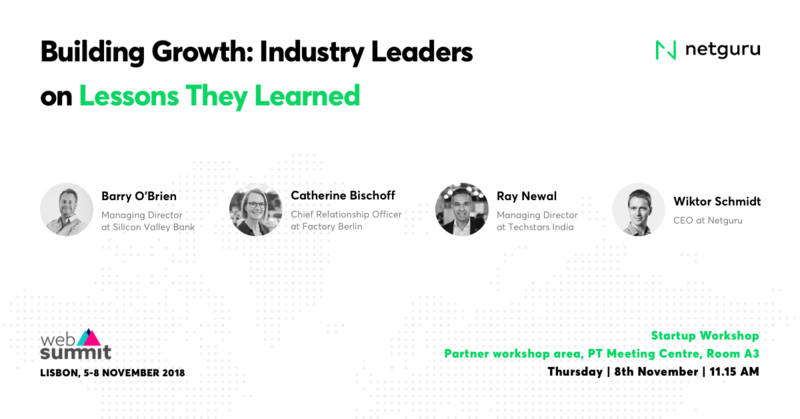 Long story short: here are the key takeaways from our panel session “Building Growth: Industry Leaders on Lessons They Learned” at WebSummit. This is a trivial truth – save for a few exceptions, it's hard to name a startup founder lucky enough to have hit the market right with their first idea. But have you ever wondered how many tries does it take to pull it off? Silicon Valley Bank, a U.S.-based high-tech commercial bank may know the answer. We have a massive amount of data. If you look at an average successful founder, it takes 3.2 startups to finally succeed. If you look at teams, an average successful founding team has 2.7 employees, said Barry O’Brien, Managing Director at SVB, one of the largest banks known for providing funding to startups. The average numbers presented above might seem nothing but anecdotal data. In fact, they convey a truth hidden in plain sight yet often overlooked. If you want to bring a team on board, you need to get these people to buy in. Too often I meet people who are convinced that they won’t give any equity to the first hires only because the startup was their idea, said Barry O’Brien. To which I always say that 90 per cent of 0 is 0, whereas 20 per cent of 100 is 20. Unless you’re willing to share the wealth to get everyone involved in the mission, you may as well quit your startup right away, he added. Gathering as much intel on investors may seem obvious. Yet many founders get too excited at the very first sound of a big VC brand. Too often they are not even familiar with the terms on their term sheets. Startup founders tend to exaggerate the importance of funding. They think that once they sign the papers, it is going to be great. Nothing further from the truth, warned Ray Newal, Managing Director, India at Techstars. Newal knows this firsthand. A few years back, his startup secured a funding from one of the top VC funds. But then things turned a little less smooth. 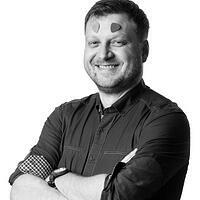 If I could do anything differently, I wouldn't have raised money so early, added Newal. The partner who was leading the investment and the entire team parted their ways with the VC fund. We ended up orphaned. It was damaging to us in many ways. We didn’t even have the partner to help us get to raise another funding round, he said. So, what is to be done? Catherine Bischoff, Chief Relationship Officer at Factory Berlin advised getting introduced to CEOs of other companies from a VC’s portfolio. You should simply meet the founders and talk about their experiences with the VC. You may be surprised, but more often than not, they will be very honest, open, and transparent with you, she added. Factory Berlin managed to build that kind of a vibrant network for startups and entrepreneurs in Berlin. 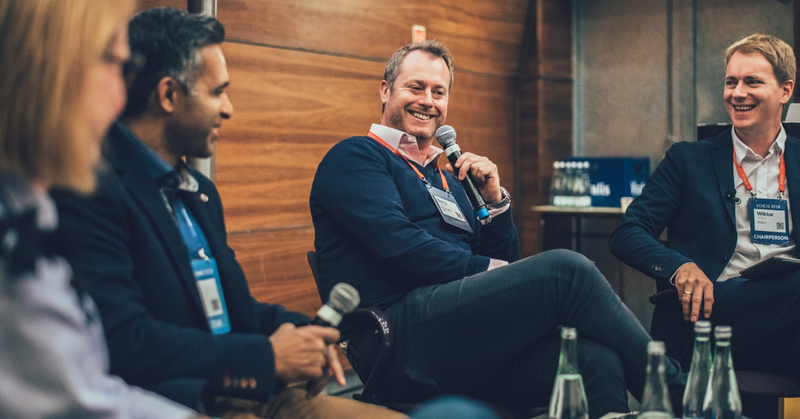 Previously, networking was somehow missing in the startup ecosystem in the risk-averse Germany.Barry O’Brien suggested looking at both the companies from a VC’s portfolio and the partners working for the VC. The cheapest thing that a VC can give you is their money. Do not focus on money, do not focus on how shiny and big the VC brand is. Instead, think about what they can bring to your startup. What is the added value on top of funding, do they have experience and networking that will help you to build and grow your startup?, he added. One of the most common challenges for founders is finding the right talent to push the startup forward along the journey. And this challenge starts right at the beginning: when you look for a co-founder and seek your first new hires. You need to find people that are philosophically aligned to what you’re heading towards and simultaneously willing to cut the cord if it is not the right match, Catherine Bischoff advised. With startups, their only asset is people. There are no tractors or factories yet. But if your first people are not your best asset ever, you will probably never start making any tractors, Barry O’Brien added. The participants raised one more key issue in building a team and a company: diversity. They pointed out that it is crucial to ensure the diversity of teams in terms of gender, varied cultures, environments, and professional backgrounds. The diversity in thinking process is what enables building growth, Barry’OBrien said. Catherine Bischoff from Factory Berlin added that she has observed a lot of evidence that the diversity principle works in Europe as well. If you’re building a company out of Europe, you already have to deal with different regulations, different cultures and mindsets, and different languages. The companies that we’ve seen successful had built into their DNA that need of having different perspectives, she added. One of the topics that emerges almost every time in any startup-related discussion is innovation. The panel organized by Netguru was no exception. The audience wanted to know what our guests felt about the vast number of copycats in tech startups nowadays. The answer is best summarized by Ray Newal’s reply: "Execution matters more than the initial idea." The truth is that there are a lot of crossover of ideas, especially tech-enabled ones. I don’t care if a company that I’m looking to invest in is building something that exists elsewhere for the different market. As long as there’s something they know that others don’t, he added. To support his view, he referred to the urban transportation industry, comparing Uber with its Indian-based competitor Ola. Founded in 2010, the company offers a network of over one million drivers and their taxis, private cars, or rickshaws in India. Ola has started to expand beyond the local market – first, it was Australia, and the next stop is the UK. It turned out that Bhawish Aggarwal, who co-founded Ola, knew a lot more about the Indian customer than Travis Kalanick, who build Uber. A very similar idea, but a very different execution, Ray Newal added. Ray Newal of Techstars shared his lessons learned as an entrepreneur. Back then, he thought that his idea of streaming video on feature phones would take off in India. But it didn’t, at least not at that time. One of the things I've learned is that you need strong empathy for whoever your customer is. A lot of my thinking was on the macro level, I didn't have enough empathy for who those users really were, he said. He also advised founders to do as much as they can to understand the problem and connect the dots on how they're going to deliver the solution for this problem to the customer. Our panellists agreed that the world and local communities are too complex to expect one idea to be plugged in anywhere in the world and work. Saying that if something works in California, London, or Berlin it will work in any place is kind of silly, Barry O’Brien added. 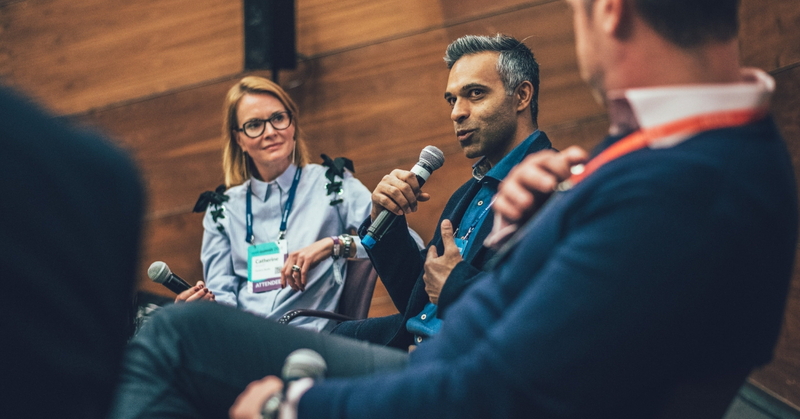 The panel hosted by Netguru was a part of the Startup Workshop Track at WebSummit 2018.